I've told you that I am five years older than my brother, Forrest. That isn't so much now that he is 59 and I am 64, but when we were children it was a lot. It meant that I was bigger than he was -- although, it you look at that picture of the two of us in Joy, Forry, & The Big Hunk, not so very much bigger, considering that I was five years older! And it meant that I was more experienced in the world, so smarter in that way than he was. For a long time I was faster and more coordinated than he was. So far I have confessed to cheating Forrest out of the bigger piece of the Big Hunk and hitting him over the head with a croquet mallet when his seven-year-old skills couldn't win the game against my 12-year-old skills and so he cheated. I also, just about that same time, used to hold him up on the see-saw until he told me how beautiful I was. We moved to Puerto Rico, when I was nine and he was four, and our mother was pregnant with Colleen. One day while she was taking a nap, I first set him up by telling him the story of Saint Stanislaus, who ran away from his life as a Polish nobleman and became a Jesuit priest against the will of his family. Then, ever so cleverly, I suggested that Forrest might also like to become a saint, packed up some clean underwear, a slice of bread, his favorite doll, and a nickel in a napkin, tied it to a stick, and sent him on his way. Then it began to occur to me what I had done -- sent a four-year-old out with his belongs on a stick in a place where he didn't even know the language. When I couldn't find him, I had to wake my mother up and tell her that "I think Forry ran away" -- but as soon as she saw the napkin, I was busted. I didn't stay bigger than he was for long. The summer that he was 13 we ran into his teacher while on vacation and she remarked, "Oh! Now I know what Forrest meant when he said his little sister goes to college!" I didn't stay faster and more agile, either. He had longer legs and was involved in sports. 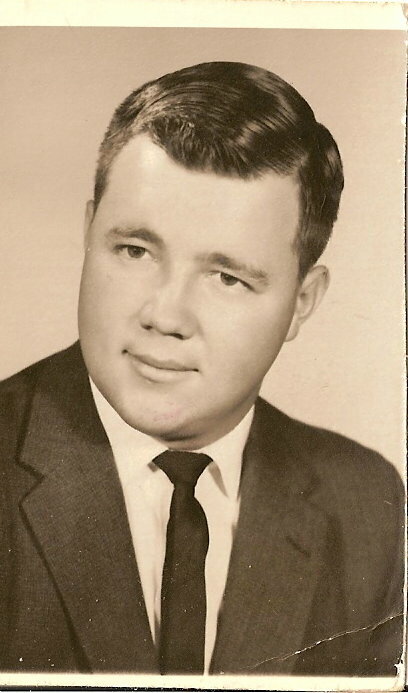 By the time he was 18, he was a very handsome young man, I was the mother of two, and he became Richard's and Julie's ever helpful Uncle Forrest. Forrest, "So, how does it feel to have all that gray hair?" Me, "Sweetie, it is just glorious to have hair." As Forrest himself remarked, after all these years he still hasn't figured out how to avoid setting himself up. J, this post was a pure delight! I'm still laughing from your wonderful words. The image of Forry leaving home with his meager "stuff" hanging from a stick...well, it's just too precious for words...although, you managed very nicely to tell us. This was SO adorably heartwarming...thanks J. All your stories are heartwarming, and I love reading them! I don't suppose you lived in San Juan, or that you knew a little boy named Stan?